In 1968, the Massachusetts Association of Afro-American Police (MAAAP) was founded in Boston, by Black Police Officers from the Boston, MA and Metropolitan District Commission Police Departments. Its membership included Black and Hispanic law enforcement officers. 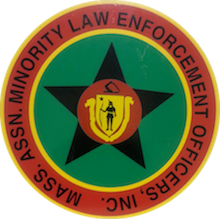 Historically, the foundation of MAMLEO's goals and mission are based on the former organization it replaced in 1983 - The Massachusetts Association of Afro-American Police, Inc. (MAAAP) due to the growth of the organization and the ethnic diversity of the membership, a vote was taken to change the name to better reflect the multiculturalism of the organization. The Massachusetts Association of Minority Law Enforcement Officers, Inc.(MAMLEO) is a 501C-3, Civic Law Enforcement Association comprised of a diverse group of Sworn, Retired Officers and Civilians who are African American, Caribbean, Hispanic, Asian, and Cape Verdean. Our membership includes officers and civilians from Boston as well as officers from Lowell, Methuen, Lawrence, Brockton, School Police, Sheriffs Dept, Longwood Security and Constables just to name a few.